Come, witness the magic of Ran'D Shine at Dickens, April 25th - 27th beginning at 7:00 p.m.! With the flick of a wrist, the Philadelphia native has become a global phenomenon by wowing the most diverse and wildly appreciative audiences for more than a decade. His unique style and presentation so impressed President Barrack Obama that he was invited to be a special performer for the “Salute to Heroes” at the 44th Presidential Inauguration Banquet and Ball in 2009. Shortly thereafter he headed across the Atlantic to Capetown, South Africa where he performed his one-man show, “Mysterious Ways”, which was also selected for 20 performances at The South African National Arts Festival in Grahamstown, South Africa. 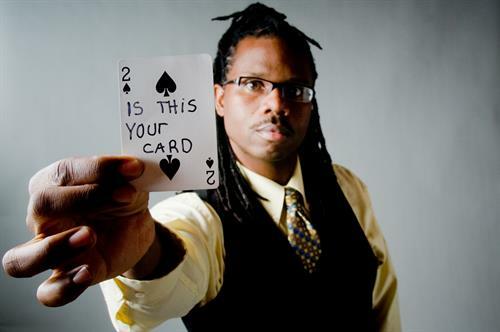 As one of the most sought after magicians on the college circuit, the pioneering performer continues to astonish and amaze audiences with his craft. His brand of magical comedy and entertainment has been on display at Hollywood’s ‘Magic Castle’ as well as ‘Monday Night Magic’, New York’s longest running Off-Broadway magic show. All Performances subject to change *All Performers Subject to change with out notice.